Recently, we were lucky enough to receive a sample box of goodies from Sanrio.com featuring Hello Kitty friend, Keroppi. It’s always nice to see & touch the products we promote and I have to say, I was very pleased with the box we received. The only condition attached to receiving the sample box was to write an honest review of the products so here it is! The opinions contained here are our 100% own and although we did receive free products, no other compensation was or will be received. The first item out of the surprise box was this super cute child’s baseball cap. It features a Keroppi face on the top and has a fun check pattern underneath the brim. It feels well made and fairly sturdy – certainly tough enough to withstand a summer or two of wear. Next out of the box was this gorgeous cute Keroppi foldaway mirror. The cover is a plush like fabric and the mirror is tucked inside and measures about 6×4 inches and can be propped upright by using the back cover to form a triangle. It’s definitely not a child’s toy but if your little one well behaved and understands how not to break a mirror, I’m sure they would love this Keroppi mirror. At first I thought there were only the two items in the box but as I picked it up, I heard a noise and decided to double check. It’s just as well I did because tucked at the bottom was this super cute mini coin purse. It fits in the palm of my hand and comes with a tiny green bell & a ball chain. It’s also made of a plush type of fabric with a silky feeling fabric lining. 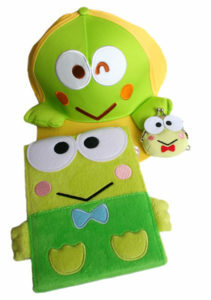 I’d say it would be perfect for any child who loves Keroppi! There’s a whole bunch of other cute Keroppi items for sale on the Sanrio site as well as all the other friends of Hello Kitty. If I had purchased the items we received, I would have be very pleased with their quality and I have no doubt that if I was giving them as a present, my gift recipient would have loved them too! Sanrio offers all kinds of items for fans of Hello Kitty and her many friends. There are various items available on the site featuring each of her friends, so there is something for every Hello Kitty fan out there, whether big or small, male or female. Each month features a “Sanrio Friend of the Month” which highlights products from one of Hello Kitty’s many friends. This July is Kerroppi month and there’s even a free Keroppi collectible pin if you spend $30 or more! Be sure to stop by Sanrio and check out all of the cool Kerroppi items.